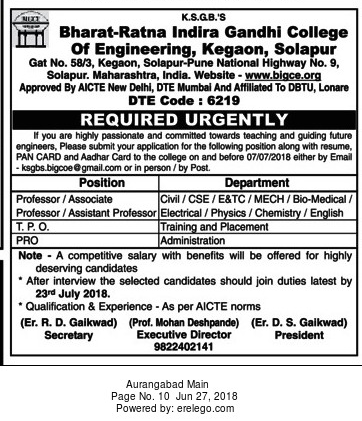 Bharat Ratna Indira Gandhi College of Engineering, Solapur has advertised in the LOKMAT newspaper for recruitment of Teaching Faculty- Professor / Associate Professor / Assistant Professor Plus Non-Faculty jobs vacancies. Interested and eligible job aspirants are requested to apply on or before 07th July 2018. Check out further more details below. About College : The promoting body is Kai. Sushilatai Gaikwad Bahuuddeshiya Sanstha, Solapur. The trust is established by a group of active and enthusiastic members with a sole intention of imparting education to the needy and to spread the activities for the betterment of the region. Bharat-Ratna Indira Gandhi College of Engineering is established in 2006. We have got approval by the All India Council of Technical Education. Within 4 years we have proved ourselves as one of the best colleges in Engineering field. How to Apply: Interested and eligible candidates are requested to send their Resume along with all copies of certificates / testimonials, copy of PAN card, copy of Aadhaar card and recent PP size photos to the postal address or email address provided here or apply in person.